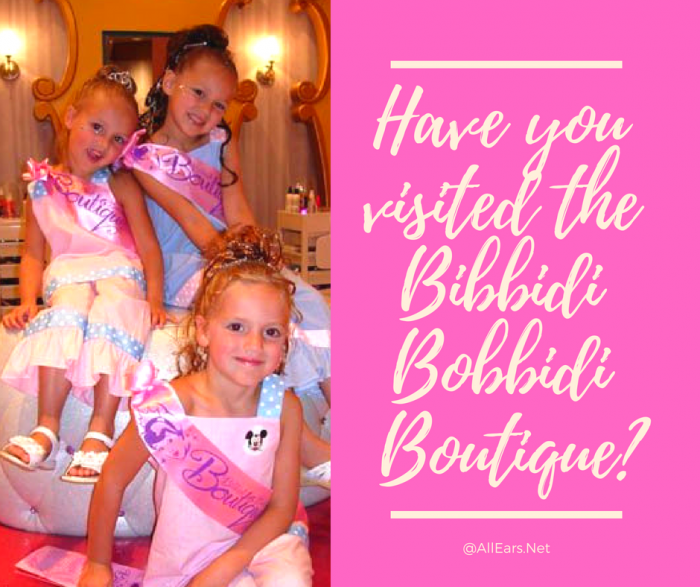 Have you experienced the Bibbidi Bobbidi Boutique? Leave a short review HERE! INTRODUCTION: On April 5, 2006, the World of Disney at what was then called Downtown Disney Marketplace marked its 10th anniversary with the Grand Opening of the Bibbidi Bobbidi Boutique, a special salon that transforms little girls into Disney princesses with hairstyling, make-up, and manicures. Now, the Bibbidi Bobbidi Boutique is in an expanded location near Once Upon a Toy in the Disney Springs Marketplace (pictured at left). The Bibbidi Bobbidi Boutique opened a second location in the Magic Kingdom in Cinderella Castle in September 2007. Disney Diva — Hair is pulled back, and a little ponytail hairpiece is added, teased on top, and decorated with hair accessories (shown at below right). Fairytale Princess — Hair is swept up to the top of the head and crowned with a tiara for a smooth, classic look. Color Star –Adds color to the hair. Crown: includes Hair Style, Shimmering Makeup, Nail polish, Princess Sash and cinch sack: Starts at $64.95. Courtyard: shimmering makeup, nail polish, Princess sash and cinch sack, face gem, Bibbidi Bobbidi Boutique T-shirt and tutu. (The Bibbidi Bobbidi Boutique T-shirt will be available in youth sizes from S to XL and adult sizes S to XL. The Bibbidi Bobbidi Boutique tutu will be available in two sizes, small and medium.) Starts at $109.95. Castle: includes Hair Style, Shimmering Makeup, face gem, Nail polish, necklace, Princess Sash and cinch sack, Princess Costume plus accessories (shoes not included). Price starts at $199.95 + tax. Price starts at $450.00 plus tax. NOTE: Price range is determined by the choice of Princess costume. Costume choices may include Anna, Elsa, Ariel, Snow White, Aurora, Belle, Jasmine, Cinderella, Tinker Bell, Tiana, Rapunzel, and Merida. KNIGHT PACKAGE: Includes hairstyling with gel, confetti, as well as a sword and shield. $19.95. DELUXE KNIGHT PACKAGE: Includes Prince costume, hairstyling with gel, confetti, as well as a sword and shield. $79.95. Note: Other specialty packages, such as one featuring the characters from current Disney films or shows, are occasionally offered. All Disney PhotoPass photos taken at Bibbidi Bobbidi Boutique are included with the purchase of Memory Maker (if captured during the applicable Memory Maker window). Before your visit, be sure to order Memory Maker online or in the My Disney Experience mobile app. However, you can add an Imaging Package to any other package. It includes ONE 6″ x 8″ and FOUR 4″ x 6″ photos in a special holder for $32.95 plus tax. — Children must be between the ages of 3 to 12 and must be accompanied by an adult. — Hair must be free of all styling aids/products like gels, mousse, hair spray, barettes, etc. — Fingernails must be clean and free of all nail polish/decals. Bibbidi Bobbidi Boutique’s Disney Springs location is open 8:45 a.m. – 7:30 p.m. daily, seven days a week (subject to change). Walk-ins are accepted; however, appointments are strongly encouraged by calling 407-WDW-DINE or WDW-STYLE (939-7895) as far as 180 days in advance. NOTE: A valid credit card number is required at time of booking. A $10 cancellation fee will be applied for all no-shows or if reservation is cancelled within 24 hours of experience.